INDIANAPOLIS, April 13, 2017 – Over 900 gymnasts are expected to compete at the 2017 Women’s Junior Olympic Level 9 Eastern and Western Championships scheduled for April 28-30. The Level 9 Eastern and Western Championships are the culmination of the Junior Olympic Level 9 competitive season, and each features the nation’s top Level 9 gymnasts in the respective regions. 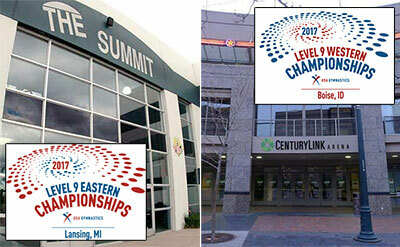 The Level 9 Eastern Championships will be held in Lansing, Mich., at Summit Sports and Ice Complex, with the Western Championships staged in Boise, Idaho at CenturyLink Arena. The Junior Olympic Eastern and Western Championships are two of USA Gymnastics’ championships events. Both championships feature the top seven gymnasts in the all-around in each age division from the respective regional championships and will have competition in 16 age divisions, which are determined by birth date. Many Junior Olympians have gone on to make the U.S. National Team and represent the United States in international competition and/or to compete in collegiate gymnastics. The Greater Lansing Sports Authority and Gedderts’ Twistars USA Inc. are organizing the Eastern Championships, which features the top Level 9 gymnasts from USA Gymnastics Regions 5-8. The states that comprise each region are: Region 5 – Illinois, Indiana, Kentucky, Michigan, Ohio; Region 6 – Connecticut, Maine, Massachusetts, New Hampshire, New York, Rhode Island, Vermont; Region 7 – Delaware, Maryland, New Jersey, Pennsylvania, Virginia, West Virginia; and Region 8 – Alabama, Florida, Georgia, Louisiana, Mississippi, North Carolina, South Carolina, Tennessee. April 28 – Session 1 – Juniors 1 and 2 at 9:35 a.m., Session 2 – Juniors 3 and 4 at 1:35 p.m., and Session 3 – Juniors 5 and 6 at 5:35 p.m.
April 29 – Session 4 – Juniors 7 and 8 at 9:35 a.m., Session 5 – Seniors 1 and 2 at 1:35 p.m., and Session 6 – Seniors 3 and 4 at 5:35 p.m.
April 30 – Session 7 – Seniors 5 and 6 at 9:05 a.m., and Session 8 – Seniors 7 and 8 at 1:05 p.m. Awards are held at the conclusion of each session. All times are Eastern. Tickets are available onsite: training day (April 27), adults – $10, and children (5-12) and seniors (65+) – $5; one-day pass, adults – $25, children and seniors – $10. Children 4-and-under are free. The Western Championships, which showcases the top gymnasts from Regions 1-4, will be hosted locally by the USA Gymnastics Region 2 Committee. The states that comprise each region are: Region 1 — Arizona, California, Nevada, Utah; Region 2 – Alaska, Hawaii, Idaho, Montana, Oregon, Washington; Region 3 – Arkansas, Colorado, Kansas, New Mexico, Oklahoma, Texas, Wyoming; and Region 4 – Iowa, Minnesota, Missouri, Nebraska, North Dakota, South Dakota, Wisconsin. Based in Indianapolis, USA Gymnastics is the national governing body for gymnastics in the United States. Its mission is to encourage participation and the pursuit of excellence in the sport. Its disciplines include men’s and women’s artistic gymnastics, rhythmic gymnastics, trampoline and tumbling, acrobatic gymnastics, and Gymnastics for All (formerly known as group gymnastics). For more information, log on to www.usagym.org.